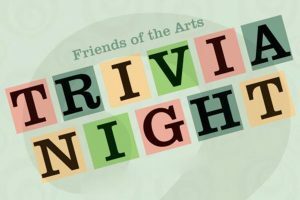 Don’t miss your opportunity to take home bragging rights at this year’s Friends of the Arts Trivia Night. Don’t miss this year’s Friends of the Arts Trivia Night, Saturday, February 9, at the Center for Visual Arts (CVA), room 110 on the campus of Illinois State University. Doors open at 5:30 p.m. The games begin at 6 p.m. The event is open to the public. Dress up as a favorite movie character (optional) and enjoy a movie-themed trivia night! Food, drinks, and hints available for purchase. All proceeds support scholarships and grants for Illinois State University College of Fine Arts students. Register online by Wednesday, February 6, for $100 as a team of up to eight players or $15 per person. Students may register for $10—ID required at the door in order to receive the discount. If you do not have a team, we will assign you to one. Free event parking is available in the School Street Parking Deck (400 W. Beaufort St. at School St.) in any spot numbered 250 and above. Public parking is also available in the South University Street Parking Deck (600 S. University St., just north of Beaufort) for $1 per hour. Please note that on weekends, surrounding red and green surface lots are also free and are marked as such on the signs posted at the entrance of each lot. If you will need special accommodations to participate in this event, please contact the College of Fine Arts at (309) 438-8321.